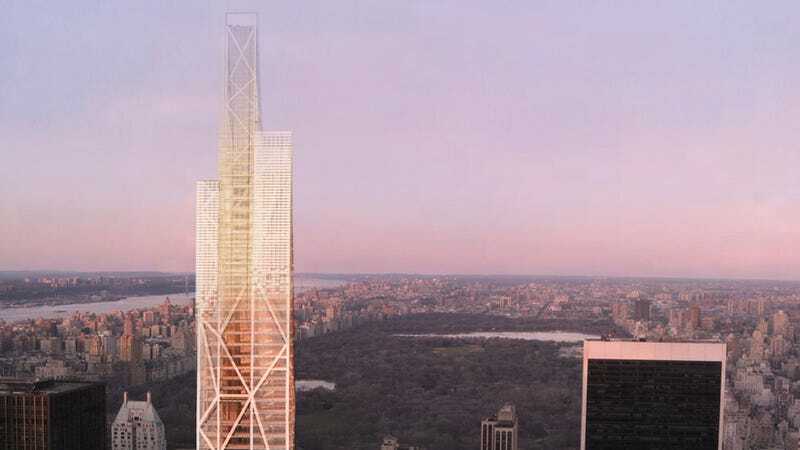 A new $1 billion financing package from a group of Asian banks is breathing life into a stalled plan to build the 1,050-foot-tall MoMA Expansion Tower on West 53rd Street. The building at was designed more than seven years ago by French architect Jean Nouvel—who imagined a shard-like steel framework of cross-bracing that terminates in three sharp glass wedges up top. Inside, the building would house 145 condos and 36,000 square feet of gallery space for MoMA—an almost 20 percent expansion for the museum, which is located next door. According to the Wall Street Journal, this cash infusion is just the latest peg in a new real estate trend: The resurrection of mega-projects all over the city that have been dormant since the 2008 crash. Other towers that have been given a second chance this year? The Herzog & de Meuron-designed 56 Leonard, plus Norman Foster's 50 United Nations Plaza.